One could say that this ancient truth has gone on steroids in our time. I am increasingly aware, as a Baby Boomer, that I belong to the last generation of humans who grew up with an experience of being “off the grid.” Many of us who have crossed the divide into the digital age are sensing by now the mixed blessing of what it means to be connected 24/7. I am grateful for the gift of still knowing how to live and work off the grid, at least some of the time. Much has been written by now about the risks and dangers of being addicted to our wireless technologies. (See for example Last Child In the Woods: Saving Our Children from Nature-Deficit Disorder, by Richard Louv). I had the kind of childhood Louv describes in his book. I was given what would now be seen as extraordinary freedom to roam a wide range of Northwest forest and seashore as a kid, unsupervised, and with no electronic monitors keeping track of my every move. I am so grateful for that experience, and for the positive ways I was shaped and formed by this freedom to explore and discover on my own. I’ve also known, as a younger climber and Alaskan commercial fisherman in the era before the internet, a different kind of solitude than is possible today. In my experience there is a different intensity to one’s encounter with beauty as well as risk, when it is wrapped in the vulnerability that comes from being truly off the grid. Knowing that we couldn’t just call in a helicopter if we got injured in the mountains, changed the experience of being in the mountains. It transformed the experience of solitude into something more visceral and real. Do we not domesticate beauty when we remove ourselves too far from the truth of our actual vulnerability? If we are not careful, the technologies that connect us can trap us inside a false sense of security that separates us from our own wildness. That is one of the reasons I so relish my summer months and Inside Passages retreats based out of Keene Channel Lodge in Southeast Alaska. That is also why I ask my clients on these retreats to take a vacation from technology during their week in the wild, to open themselves to a “digital detox”, as part of what it means to recover our wholeness. To bring our bodies and minds into the same place at the same time, in a spirit of deep listening, is a radical act of generosity and healing. There is a psychic burden that lifts for me, a swelling of the heart, every time I arrive back in Keene Channel each summer. I feel it immediately, though it always takes a few days for ‘the soul to catch back up with the body’, days of settling into the rhythm of the tides, of moving outside of clock time, and tuning myself more to the cycle of daylight and darkness, flood tide and ebb tide, changing patterns of weather, and days spent deeply immersed in place. There is a slow trajectory to waking up from the trance of busyness that I carry with me from my winters in the city. But the gifts of true solitude are always there waiting for me, generous and unfailing, ready to welcome me back as an old friend. For many of us in today’s fast-moving, fast-changing world, the benefits of slowing down, of truly going off the grid, have become an extinct experience. This seems especially true for the emerging generation, born into the internet age, whose whole life has been defined by hyper-connectivity. But I don’t believe that the power and potential of solitude, or of the inner freedom that can grow from solitude, will ever go extinct. It is hardwired into our genes by thousands of generations of living more directly in place, and off the grid. Practicing mindfulness in an environment that cultivates this kind of inner and outer solitude is important, not only for our own well being, but for the well being of the wider world with which we interact. When we come home to ourselves in a deeper way, we open to the world around us differently too. We open to the places we call home, to our loved ones, our work and our community, in a more whole-hearted way. In so doing, we become more whole ourselves. How else can we ever bring healing to the world, if we have forgotten how to be at home in our own skin? That has been my mission for twenty-five years as a guide with Inside Passages, linking the power of wilderness with the power of mindfulness, to re-stitch our lives into a new and more vibrant wholeness. One of the things I most love about my work at Keene Channel Lodge in Alaska is that I get to combine so many parts of my life all in one place. When groups arrive at the lodge I get to step into my roles as a mindfulness teacher and kayak guide, parts of my life experience that I love to share as a former clergyman, long time Zen student, commercial fisherman and wilderness guide. But in between, and around the edges of these retreats, there is a ton of work to do. Since the lodge is off the grid, and fourteen water miles south of the town of Petersburg, I have to make runs to town at least once a week in my skiff, for food, gas, propane, general supplies and building materials. Every year I also have at least one shipment of bulk food and supplies that I send up on the barge from Seattle. All that stuff has to be hand loaded into my 18’ Lund skiff and brought down the Wrangell Narrows to the lodge, then hand carried up the beach and stowed. My skills as a carpenter, plumber and electrician are constantly pulled into the mix of what needs to be done. Firewood has to be bucked and stowed a year in advance, so that it will be dry and ready when I arrive back at the lodge in the spring. Luckily, it is all stuff I love to do, and I revel in the off-the-grid lifestyle. But in recent years - as I get older and smarter - I’ve come to my senses and started to pull in some help. 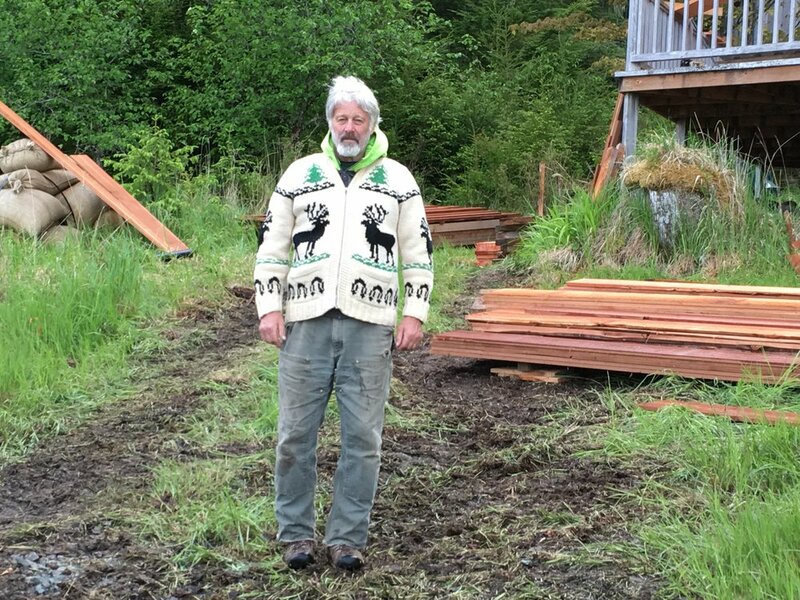 My brother Kim Hoelting is a builder and woodworker, and he has really stepped up, coming to help me with work the past two summers, and bringing some of his best carpenter buddies to the lodge for a serious work party the summer before last. 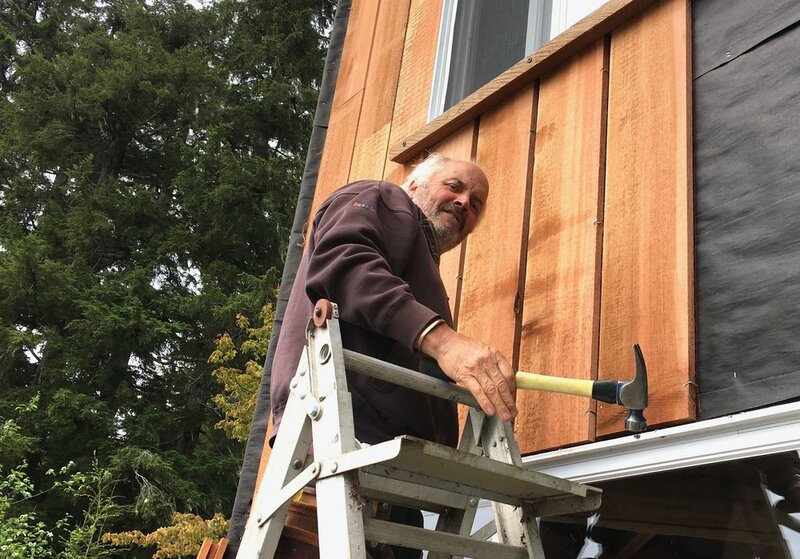 We’ve made some big improvements, re-siding the lodge with hand milled old growth red cedar, and installing beautiful hand-made entry doors. 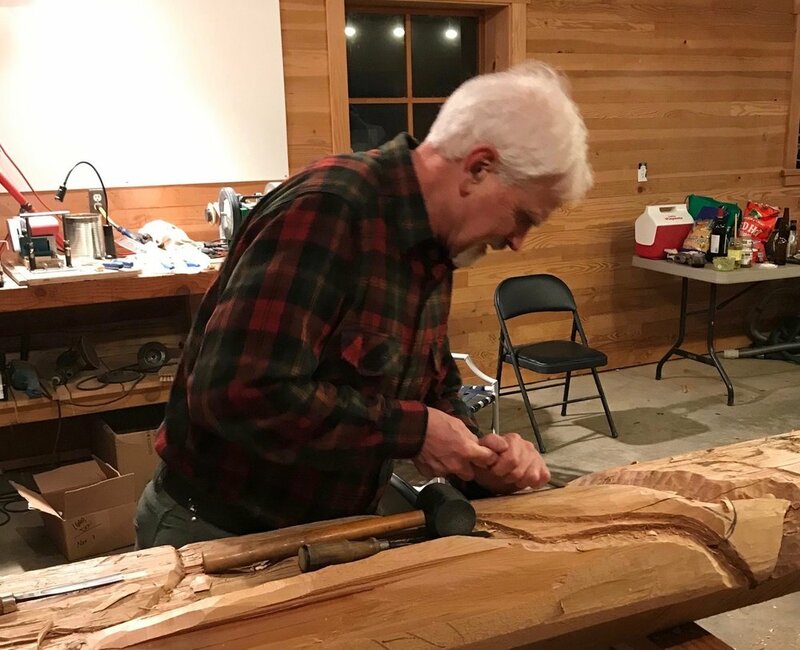 The front of the lodge is a high prow, and my old friend and carpenter mentor Phil Stringer came up with the idea of carving a story pole to adorn that front prow. We were all reeling that summer from the recent death of my son Alex, and this could be a way of honoring his memory. Keene Channel was Alex’s favorite place in the world, and a story pole should be carved in his memory. Well, that was the kind of idea that rolls off the tongue easily in the flow of good work. I was moved by the suggestion, but ideas like that are usually quickly forgotten. I never heard it come up again. But while I was in Alaska last summer, the idea got legs. When I returned home to Whidbey Island last fall my brother informed me that this was to be our group project for the coming winter. Who am I to stand in the way of an epic creative initiative like this? 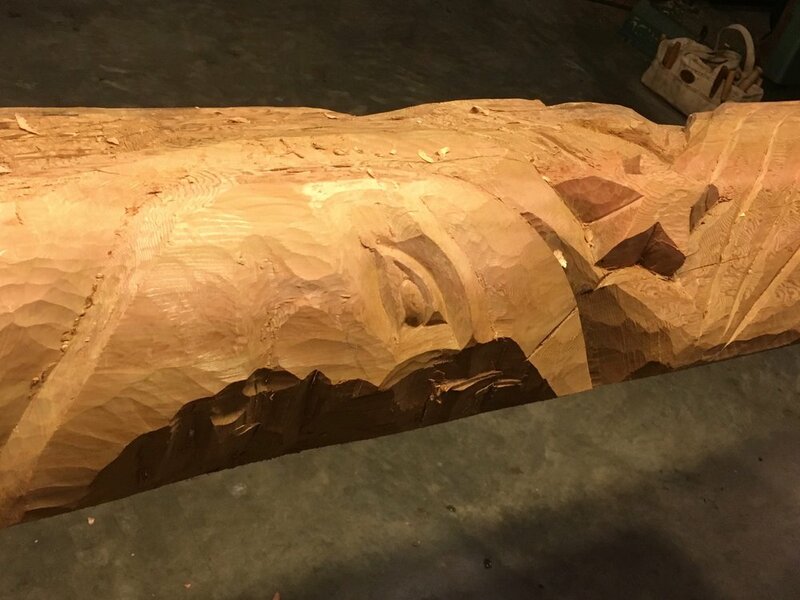 Among our group of local Whidbey island woodworkers is my neighbor Nathan Gilles, who has emerged as a premier Northwest Coast carver in recent years. It has been our great good fortune to have Nathan join us as an advisor and teacher on this project. 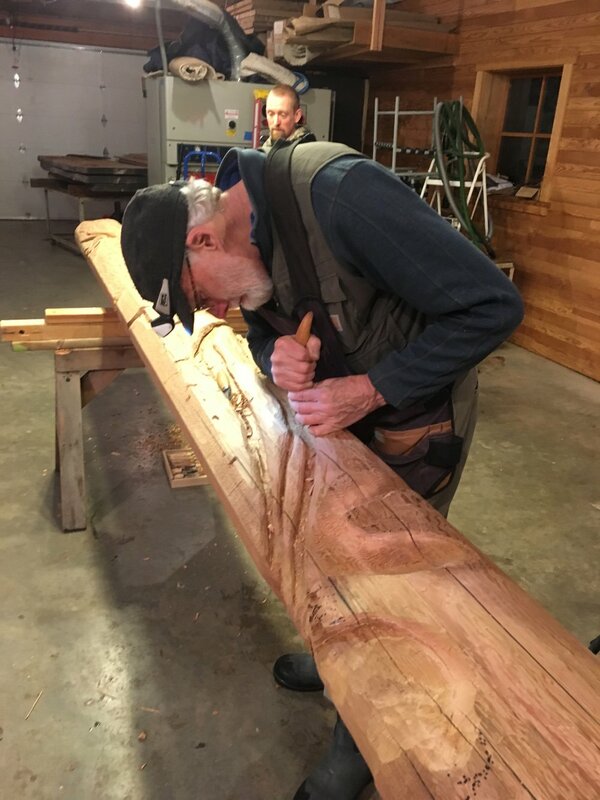 This picture shows Nathan at work on a recent totem pole project for the Jamestown S’klallam tribe on the Olympic Peninsula of Washington State. So here are a few images of our work in progress. I am incredibly excited that this work, and the spirit of friendship and craftsmanship that lies behind it, will soon grace the front of Keene Channel Lodge, to be enjoyed by all who come there. Click on the images below for a view of the story pole in formation. These images show me, Kim Hoelting, Doug Kelly and Richard Merrill at work last week. It is our hope that the pole will be in place at Keene Channel Lodge next summer in time for my Inside Passages retreats. As I prepare for my season of Inside Passages kayaking retreats in Alaska this coming summer, I want to share this essay that I wrote 20 years ago, in 1997 for EarthLight Magazine. The essay was later included in the book Earthlight: Spiritual Wisdom for an Ecological Age, edited by Cindy Spring, and published by Friends Bulletin in 2007. It gives a picture of what we do on these trips that is still relevant today. Maybe more relevant than ever, given the rapid acceleration in the pace of our lives that have occurred over these two decades. We are several days into our kayak journey now, and the pace is slowing. We are finally getting here. As agreed, we have been paddling for an hour in silence, threading the island tapestry toward a seemingly impenetrable wall of ancient forest that looms ahead. Our group of twelve travellers, coming from all corners of the continent, have settled into a remarkably cohesive community in the few days we have been together. Now, as we round a bend into the estuary, almost miraculously, a gateway appears in the forest, and even the sweep and cadence of our paddles are laid to rest. Only now does the full force of the silence truly descend on us. It is a potent presence, pouring into our senses as palpably as the tidal current that carries us into the gate of the forest. Early in the trip the silence had felt strange, a little disorienting. But as our days unfold, we are falling under its spell. There is a deep sense now of being held, both by the silence and by the flowing water, which grows even more luminous as our kayaks settle to the pace of the tide. Our gaze is drawn downward, beneath the surface, where schools of pink and chum salmon circle and scatter below our kayaks. The splash of leaping salmon echoes in the silence every few seconds. Each splash seems to linger in the air, almost as if a bell has been struck. I smile to myself, thoughts circling and scattering like the salmon beneath me. It feels so right for me to be guiding this trip, here in this coastal wilderness of Southeast Alaska. For years I have fished these waters commercially for salmon and halibut. Now I am seeking to be here in a new way, a way that accords more closely with my Zen practice. I now invite people to this pristine wilderness to explore meditation, in a setting that adds a new dimension to the Buddhist notion of "Original Nature". In unexpected ways my life has come full circle. My thoughts drift back in time to the early 1970's, when as a young theology student at Harvard Divinity School, I wrote a thesis paper entitled Wilderness as an Ethical and Spiritual Imperative. In it, I suggested that the ecological crisis is at root a spiritual crisis, and that our reigning belief systems are dangerously out of step with the way ecosystems actually work. It was a perspective conspicuously absent from theological education at the time, one which seems only now to be finding a voice in our established religious institutions. These days I have plenty of company in this conviction. Still, I wonder to myself where I would have gone with that thesis if I had known more about Buddhism then. In retrospect, my ordination as a Protestant clergyman, and my brief career as a university chaplain, were an awkward and unsettled time for me. I was sincere enough in my aspiration to the ministry. I was definitely responding to a call. But I know now that the call was toward a different path. I was swimming against my own inner current, frustrated in my yearning for an Earth-honoring spiritual tradition. A new commotion on the stream bank calls me back. Up ahead, where the estuary narrows, and the spawning salmon are concentrated in a large pool, a black bear has emerged from the forest. Oblivious to our presence in the silence, she plunges into the stream and quickly retreats with a ten pound chum salmon struggling in her jaw. Finding what she wants so easily, she withdraws back into the safety of the forest, carrying her lunch with her. She never saw us, or heard our astonished gasps. Soon we pass the spot where the bear snatched her meal. The surface of the pool is still roiling with hundreds of agitated salmon. I have seen this spectacle before, but rarely at such close range. I am wide awake now. This is closer than I like to come to a fellow predator who is clearly the one in charge here. I think of Daniel Goleman's observation that, through most of our evolution as a species, the big theological question has always been, "Do I eat it, or does it eat me?". At the moment the question feels uncomfortably relevant. Edging the group to the opposite side of the stream, I comment that, until the very recent past, this kind of wild encounter was a normal part of the experience of every human being, everywhere. Further upstream the estuary widens again, and we breath a bit easier. Ancient moss-draped Sitka Spruce and hemlock trees give mute testimony to centuries of standing watch over this place. A pair of bald eagles, a family of mergansers and a flock of Canada geese all retreat deeper into the watershed as we approach. Where the geese had been, a dusting of goose down feathers float lightly on the water. What we are seeing here is rapidly becoming, in Christina Desser's words, an "extinct experience". By driving this kind of wild nature to the far margins of our world, we have placed our own psychic lives on the endangered experience list. My evolution toward Buddhism has turned continually on this awareness. The tradition of my youth has offered scant protest or leadership as we consume and discard the biological bedrock of our own souls. As a college student, working summers on a salmon seiner in Southeast Alaska, I stumbled on the writings of Gary Snyder and Thomas Merton, and my Christo-centric thinking took a hard turn toward the East. From Snyder, a poet and ecologist, I found the bridge between human nature and wild nature. From Merton, a Trappist monk, I caught the scent of something essential in the life of disciplined solitude. Both drew heavily upon Zen Buddhist thought and practice. Both recognized an ecological spirit at the heart of Buddhism. This "ecological self" fits seamlessly with what Buddhism has been teaching for 2,500 years. Paticca-samuppada (dependent co-arising), together with anicca (impermanence, ceaseless change), both core concepts in Buddhism, provide a perfect spiritual counterpart to the view of the universe now emerging from the ecological sciences. Albert Einstein declared that, "If there is any religion that would cope with modern scientific needs, it would be Buddhism.". Here, the world is seen, in Allan Hunt-Badiner's words, as "a massive interdependent, self-causing dynamic energy-event against a backdrop of ceaseless change". (Dharma Gaia). In such a universe, how can we be "separate"? Where does "nature" leave off, and "I" begin? Wu Wei Wu put it bluntly when he asked, "Why are you unhappy? Because 99.9% of what you think, and everything you do, is for yourself. And there isn't one." Western religious traditions are certainly not indifferent to this problem. In many ways they seek to mitigate our excessive preoccupation with the ego-based self. But in my view, they do not dig deeply enough to the core of the self and its delusions. The Judeo-Christian streams, for all their inherent beauty and depth, essentially leave intact a concept of the self as separate, an entity that stands apart from and above nature, that can somehow be "saved" or "lost" independent of its fellow creatures, independent of its total environment. They also substantially fail to disentangle themselves from the legacy of anthropocentrism, from a moral universe that Theodore Rosak has said "stops at the city limits". Many individual Jews and Christians care passionately about the Earth. However, because of this fidelity to a human-centered world, leadership in confronting the full implications of the environmental crisis has been slow to emerge from our traditional religious institutions. Buddhism, on the other hand, recognizes these errors up front as core delusions of the human mind. It intuitively grasps the tenacity with which the human ego seeks to advance its own flawed agenda, and offers practical, no nonsense tools with which to confront and transform the delusions of the mind. These tools form what is commonly called "practice". They are experientially based in meditative discipline, in the cultivation of intimate, non-judging engagement with the present moment. Pascal has said that, "All of man's difficulties are caused by his inability to sit alone in a room by himself.". (Pensees) Our fear of being alone, of ceasing activity and opening to the voice of silence, is fundamentally a fear of intimate contact with the real, ever-flowing and transient world. In fact, a word that is sometimes used interchangeably with "enlightenment" in Zen is "intimacy". Buddhism recognizes that intimacy is a prerequisite to love, that we cannot truly love that with which we are not intimate. And real intimacy can only be achieved by a kind of deep listening that stills and transcends the mechanisms of our ego-based mind. The despoliation of the natural environment that we have loosed on the world in our time is thus no accident, in the Buddhist view, but an extension of our limited view of self. It is an inevitable result of our failure to identify deeply enough with the world's "interbeing", to watch and listen in this fundamental way. As we wake up in the West to the magnitude of the environmental crisis, and recognize in it a challenge that supersedes all merely human crises, Buddhism steps forward with important missing tools and perspectives for the task at hand. Though I am far from this level of knowing myself, I feel the spaciousness of my mind opening bit by bit as I learn to just sit and listen to my world, as I gradually wean myself from the "inner newsreel" of my own mind. Even these thoughts are a digression from the essential moment at hand, which calls me back now in the guise of a loon's lilting voice. I look around again at this place that feels ancient and new at the same time. I gently stroke my paddle to bring the kayak back into alignment with the current, then sink back into a place of deep stillness. Over and over I wake up thus, or try to anyway. There is no end to it, no real "enlightenment", no point at which the ego's hold on my mind is finally overcome. I don't know why, but I know it's so. Somewhere in me the conviction grows that my desire to "heal the Earth" is no other than my desire to be present to myself, to be truly alive in this precious moment. It is one and the same work. Buddhism has been a great help to me in claiming this deep intention. In spite of every digression, every setback, every unthinking act or unkind word, it always comes back to this. Where am I now? What is needed now? What is to be done? 1. Show off your beauty. Know how beautiful you are. Leap. Surge. Mingle. Dance. 2. Have grand adventures. Cross the North Pacific all the way to Kamchatka and Hokkaido. Move under your own power. Navigate by the stars. 3. Be intimate with the tides and currents. Play the edges constantly. Find your joy there. 4. Hang out with charismatic megafauna. Congregate with humpback whales and bald eagles and sea lions and humans among the tides rips and upwellings, and where the herring come to spawn. 5. Know where you are going, and let nothing stop you. Remember in your bones the exact location of the stream where you were born. Know where you are, always, in relation to that stream. 6. Turn for home when your body tells you it's time. Trust that you will find the way, and don't be daunted by any distance. 7. Give yourself away to the creatures who need you, who have waited expectantly for your return: the Swimming People, the Flying People, and the Standing People whose lives are bound so closely to yours'. 8. When at last you reach the home stream, head straight into the current and start climbing. Climb the rapids. Climb the waterfalls. Climb the very mountains. Bend yourself to that final act of love that will keep it all going. 9. Let go of any thought of preserving your beauty now. Let your body morph, sprout humps and fangs and rainbow colors. And in that final act of union, pour yourself out with your lover into the stream that will be your progeny. 10. Let it all go now. Feed the animals with your spent body. Stray far into the ancient forest as you swim down their bodies and back into the soil. Become the very flesh of the forest itself. Climb to the tops of the trees.